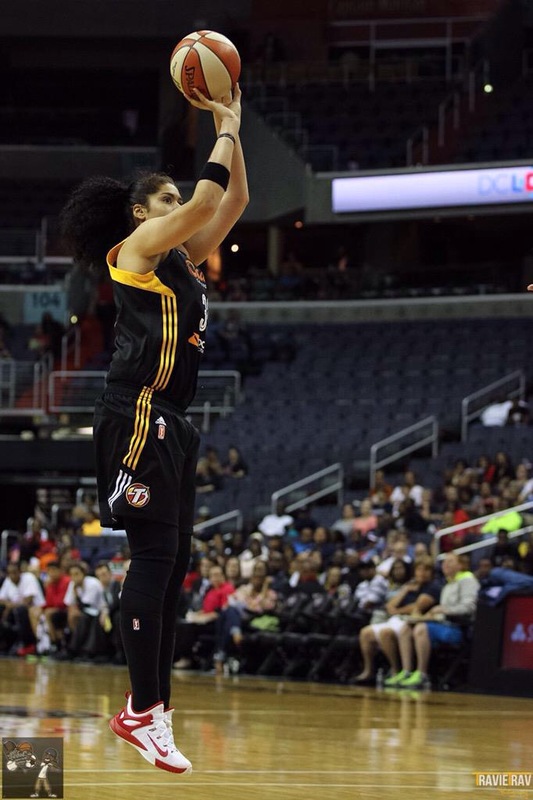 Amanda Zahui B is undoubtedly one of the fastest growing stars in the WNBA this season. After playing two seasons at college, she was picked second overall by Tulsa Shock in the April 2015 WNBA draft. Amanda made her pro-debut against the current WNBA champions Minnesota Lynx at the Target Center, where the spotlight on her has only grown brighter for the 6’5” Swedish African post player. A native of Sweden and the Ivory Coast, Amanda became the first player from the University of Minnesota to be named a first-team Associated Press All-American after averaging 18.8 points, 12.9 rebounds and 4.1 blocks and helping Minnesota get to the NCAA tournament for the first time since 2009. After giving up two years of college eligibility, Amanda is the highest WNBA draft pick since Janel McCarville was taken first overall in 2005 from the University of Minnesota. Described as one of the happiest, brightest and funniest players in the WNBA, Amanda is a personal favourite of mine. I remember watching the WNBA draft night and seeing her walking up to stage. She had one of the biggest smiles but also you could see the relief of knowing that she was the best in the league, despite coming from nowhere. Amanda started basketball late and she only got into it because her parents wanted her to try a new sport. Not only is Amanda inspiring young people in the USA but she’s raising the profile of the sport in Europe and across Africa. After a great season with the Tulsa Shock, I had the great opportunity of interviewing her to find out what it means to be an African in the WNBA and more. In a lot of your interviews, you have talked about your journey into basketball and also into the WNBA. Is there anything you could have done differently now you are here? I am not sure what exactly I would want to change, simply because I am a person who believes that everything happens for a reason because it is in God’s plans. But then again, I could’ve always worked out harder and extra, even though I put my soul and heart into everything I do and continue to do. There is always room to get better and work out more. So my answer would be that I could’ve found more time to become better. You have now completed your first year in the WNBA, what was it really like for you? What was exciting and what was challenging? To start with, I am very grateful for this opportunity that I was given and it has been and still is extremely exciting. Now I am living my dream and playing with – and against – my role models. I also think that the most challenging part of this transition to the pro-life has been to adjust to a new position on the court. I’m getting better every single day due to my dedication and hard work. I had gotten used to being the star player in college and joining the WNBA, I was no longer that player. But I got the opportunity to develop my skills by moving and playing a different position as a power forward, which can be hard to be successful at. I’m getting better at it every single day though due to my dedication and hard work. Tell me about your day-to-day playing in the WNBA? Most days, we start practice at 9:30 am. I get up earlier than most players with [Brianna] Kiesel because we’re rookies so we try to get in extra practice in before everyone else. We work on footwork, shooting and everything that we need to get better in order to support our team better. We then practice with the whole team. We have so many great players in the league who are not recognised simply because we are women. After practise, we head to lunch and then we have ‘alone time’, where I can speak to my family back home in Sweden. Later in the day, I usually go for treatment or pre-rehab to get my body right and stave off injuries. The evening, it’s dinner and then chill. It’s the same routine every day! What has been the most defining moment for you playing this season for the Tulsa Shock? The most defining moment playing this summer with the WNBA Tulsa Shock has been making it to the playoffs and achieving that goal as a team. But also having the opportunity to play against all the players that I have looked up to for many years – fighting battles on the block with them. Adam Silver recently made a comment about ‘being shocked that, the WNBA hasn’t progressed as much as he thought it would have been.’ What do you make of that comment? Well, I believe that we all have our own right to believe and think what we want. In my opinion, since I started watching the WNBA, it has grown daily. What do you think can be done to raise the profile and the level of respect for women’s basketball in the USA and globally? First of all, we have so many great players in the league who are not recognised simply because they are women. It’s not fair that we are not given the same opportunity to show off our blessings and skills as much as the guys in the NBA. The most important advice I would give to someone is to never give up. We work just as hard as the guys and we are not being given the chance to show this off to the world because we are not on TV every night. If we start to appreciate the amazing women playing the sport of basketball, like we do with the men, then we would get more respect. Do you think equal pay will ever be equal when it comes to WNBA and the NBA? Unfortunately, I do not think it will ever happen. I would hope and wish for it but the men will sadly always be paid more than us women. 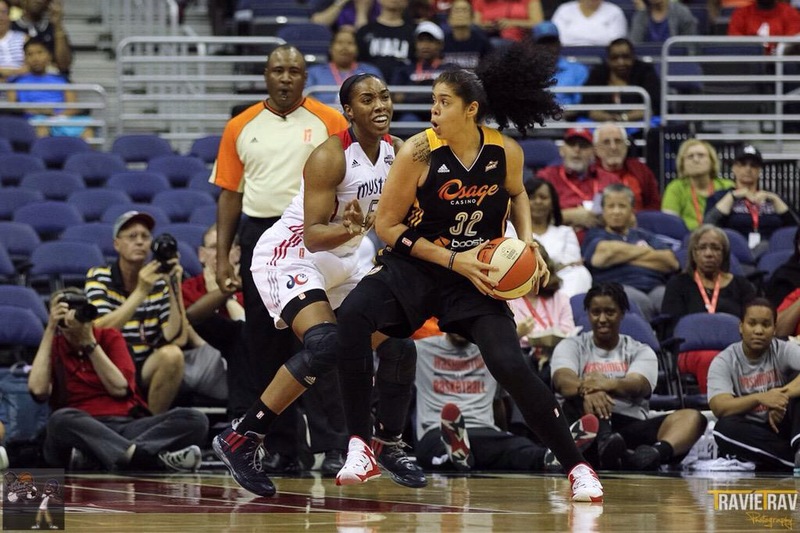 What advice would you give any young women interested in playing in the WNBA? The most important advice I would give to someone is to never give up. Never give up on your dreams, even when things aren’t going your way. Put the time in on the court and in all aspects around it to advance your game. Study the game, because if this is something that you really want, you should be willing to sit for hours to watch your role models and play yourself in order to get better. Put the time in on the court and in all aspects around it to advance your game. It means a lot to me to be African because I have family in the Ivory Coast, with whom I have a great bond. My family have always been open about our roots and the history of the continent. I have mad respect and appreciation for my culture and roots, which I carry with pride. Africa is a beautiful continent with amazing different cultures and filled with love. I love to travel to the Ivory Coast to see my family, friends and relatives. I would love to study a major in school about my history and the lifestyle back home in Africa. On top of it all, Africa is a beautiful continent with amazing different cultures and filled with love. Who wouldn’t want to be African? Why is it important to you to celebrate both heritages and how do you hope that inspires young people globally? Well, it is very important to celebrate both heritages because this is who I am and without one or the other, I wouldn’t be the person I am today. I wouldn’t have the amazing family or support system that I do have. With both heritages, I am a greater person in my opinion because I am not one-sided. I have seen both sides and I appreciate them highly. I hope that I can inspire young people to believe in themselves. I hope that I can inspire young people globally in a way that no matter where you are, where you from or how you look, you can always reach your goals and so much more. Because as individuals, we are all unique and special human beings and if we put our minds to something then we can reach those goals because God believes in us. I remember when they told me we wouldn't make the playoffs… Welp, hit the road jack cause we in there!! & shoutout to @tplai55 for holding the mic?✊? I believe in every single person who truly wants to make something happen. I hope that I can inspire young people to believe in themselves as well because I know the amazing feeling of believing in oneself and having a support system around you. And even if it’s not someone close, God always believes in you. What is the best thing about being half African? The best thing about being half African is my family, because they are amazing. My father’s side is a blessing to me and my family… We might not talk every day or see each other for years, but because of them, I am the person I am today. On top of that, the food is AMAZING, the music is crazily good and the thousand different cultures are the most beautiful thing ever. Well, if we were to go on looks, it would probably be Joakim Noah of the Chicago Bulls. Only because people think we look alike… BUT I would love for Queen Latifa to play me because I love her so much! If you could be a professional in another sport, what would it be? It would have to be tennis maybe, but I wouldn’t play in a skirt or tight leggings. Maybe a rally driver if that counts as a sport – OR boxing! I have two favourite shows, but right now Fresh Prince of Bel Air is beating Spongebob by like .5 points… ha ha I love Fresh Prince. But Spongebob is my dude! Who is the most talented basketball player you have ever played against? Ooh, wow! Well! It’s definitely between Delle Donne, Maya Moore and Tamika Catchings. But then again, there are a lot of really talented players that I have played against – especially this summer – but those are the players who I believe are the most well-rounded. Brittney Griner is on that list as well. Who would you most like to go for a drink with or a coffee with? If we are talking about a famous person, I think it would have to be Kanye West, only because I want to know what goes in his head. He is a genius. This one’s between being invisible or being able to fly. But no, I am going to make one up. I would want to be able to be invisible and every time I become invisible I could go wherever I wanted to. No taxes or anything! Ha ha, can I say that? If you were stuck in a lift with a teammate, who would be the best and who would be the worst? The best will have to be Érika De Souza and the worst would have to be… I am not sure… Whoever has the worst breath that day… Ha ha!